And, I was hooked the moment I walked in the door. 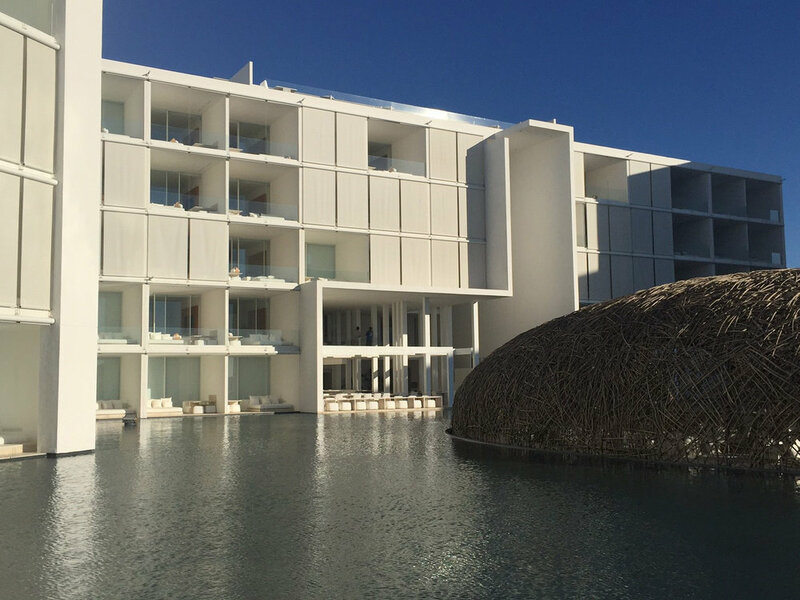 Located in San Jose del Cabo the Mar Adentro Cabos hotel is designed by the well-known Mexico City architect; Miguel Angel Aragones. The hotel was built by local artisans and created in a very linear fashion. The organic "bird's nest" restaurant seemingly floats along side the linear lines of the hotel. Inside the restaurant, artisan baskets line up mimicking the architecture. The vibe is low key and relaxed connecting guests to the water and horizon. There’s a lovely pool and beach and several beautiful spaces for cocktails and dining. And don't forget to visit the glorious spa! White on white on white, love it! The rooms have clean lines and are so well appointed that you almost don’t want to unpack and mess with the decor. All rooms are complete with the best technology; an iPad runs everything from your shades and temperature to the TV and lighting. And speaking of lighting, it has a lighting feature that virtually changes the colors of your room. But my favorite amenity is the outdoor tub and lounging space that's great for meditating, sitting or sleeping on the deck. Outdoor soak & sleep - oh yes – we did that! Structured yet fluid lines throughout. Go check out the Mar Adentro Cabos. It’s a modern hotel experience that I know you will love!